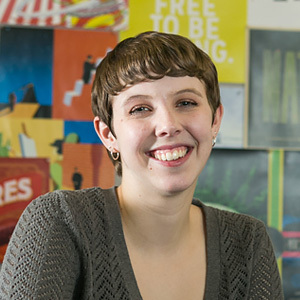 When visual communications instructor Patti Bishop heard in 2013 that former student Samantha Hurst had been honored by CMYK Magazine as one of the top 100 designers in the country, she felt nothing but pride. “She’s one of our shining stars,” Bishop said at the time. Hurst, who graduated from Delaware Tech in 2011, came to the Terry Campus right after high school. She received a full scholarship and enrolled in the advertising design program within the visual communications department. After graduating from Delaware Tech, where she won the Best in Advertising Design Portfolio Award, Hurst went to Moore College of Art & Design in Philadelphia. She studied graphic design and illustration and graduated as class valedictorian in 2013. Soon after, she landed at Bailey Brand Consulting where she is enjoying honing her design and illustration skills. She also does freelance design work and wants to start her own business in the future. For now, though, she is learning the ropes and enjoying the journey.